Professional sports – Angel or Demon? – Start now learning! Professional sports – Angel or Demon? Make sure that you enough space for all participants. A upane kaupane whiti te ra! (Into the sun that shines!!). Start slowly! Repeat several times. Materials: sheets, pens, flip chart. What are the benefits of sports to a person? What are the benefits of sports to the society? What are the benefits of sports to the nation? What are the benefits of sports to the world? Once all participants’ responses are registered, a discussion is followed, including the following questions. What injuries can the athlete get from the long practice of a sport? What kind of deprivation they make during their sporting career? What drugs and drugs are forced to take? How does their social life develop due to their long training and sports camps? Each participant writes down the answers on a piece of paper. Participants are given 5 minutes to answer all questions. At the end, the Facilitator registers all different answers. 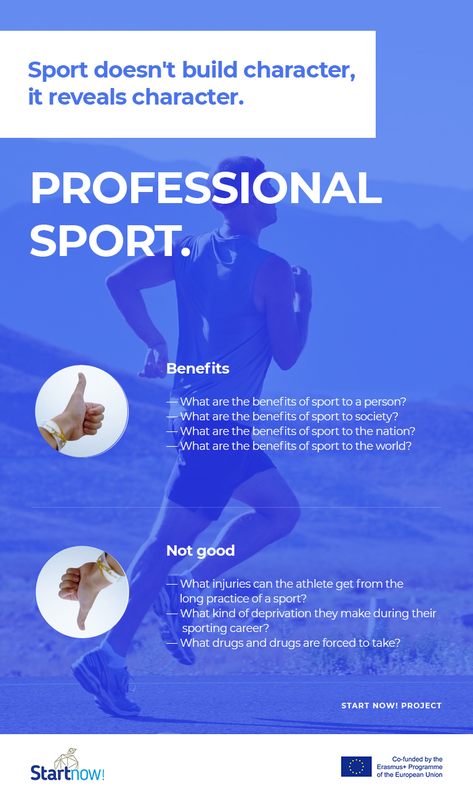 What are the benefits of professional sport for the society? Aims to use the benefits of sport on the problems of integration, multiculturalism, anti-racism, and integration, problems facing social exclusion, working with people at risk, working with people with various mental or physical problems. Do children imitate sport stars? How? Is this useful or harmful? The team undertakes the task of minimizing the risk of problems faced in professional sports and sports for all – programs for athletes with injuries, recreation programs, anti-doping campaigns and campaigns against the use of stimulant substances among sportsmen etc. What are the risks of professional sports? Please provide examples. Injuries, premature end of sports career, depressions of loss, use of doping and banned substances. What are the benefits of the professional sport to the economy, infrastructure, the labor market, health? Hosted national events, international championships, Olympic Games – how do they affect the infrastructure and the labor market? At the end, each team presents their work, for approximately 10-15 mins. Materials: sheets, pens, flip chart, Wi-Fi, PC or smart phones, markers, chairs, table etc. The Facilitator assigns 2-3 participants as jury and then divides the other participants into 2 groups. Then He/she gives each group a task: To prepare, present and defend their candidacy about hosting the Olympic Games. Both teams have 25 minutes to prepare their presentation and 5 minutes to present their presentations. At the end of each presentation 5 minutes are provided for questions and answers from both the jury and the other team. The Facilitator, together with the selected participants, form the Commission for selection of the host city of the Olympic Games, prepare the pressroom and the order of presentation of the two teams. Finally, everyone votes in secret, the Facilitator counts the valid ballots and announces the host of the Olympic Games. After the end of all activities, the Facilitator asks each participant what is their favourite sport, a favourite team or sports star, what are the benefits of sports to him/her and the society, what are the risks of using stimulants or banned substances. All participants will be asked to create a campaign on social media (as a group or an individual) portraying a sport star or sport team who promote “Clean sport” (without anabolics and steroids). Campaign or posts and pictures must have their own hashtag (#CleanSport, #StartNow, etc. ).